Flame was the best dog in the world and will continue to live in our hearts. She was a full member of our family, filled with love. She was Mark’s dog, but treated everyone else in the family (& friends) with a different and unique love to each individual. Her eyes were the most intelligent, thoughtful and loving that we have ever seen in a dog. She had the ability to wink and raise individual eyebrows. She was adopted from the Willamette Valley Humane Society. 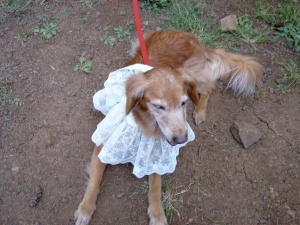 She had been found stray in the nearby city of Woodburn. She was very thin and sickly looking when we picked her. We figured she must of had puppies before we adopted her. When we first brought her home, if we left her alone in the house, she would gather all of our kids small animals and gather them around her in front of her “sofa”. 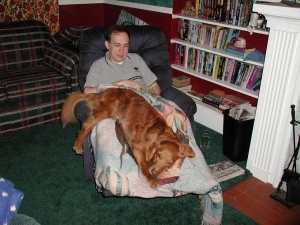 We believed she had been mistreated and was afraid of the sound of crinkling newspapers, after a few years she would walk all over the newspapers as Mark would try to read them. She had her own coach in the front window. She did not appreciate it when we would move her couch for the Christmas tree. 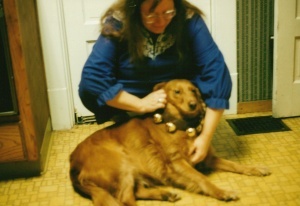 She loved going on walks and especially riding in our cars and RV over the years. 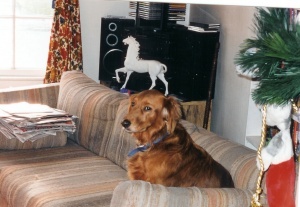 She went cross-country with us in 1996 and to Canada a few times. She was proud of the fact that she pee’ed in 22 states and 2 provinces over her life time. 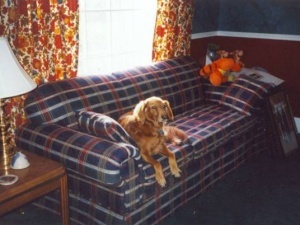 She lived a rather long life for a golden retriever at about 15 years. During her last 2~3 years she definitely slowed down and became more of a “silver” retriever. She had some arthritis in her back legs. She also had a neurological disorder that would occasionally make her loose balance. But she was able to compensate and remained a happy dog. Starting in Jan ’06 her health really started to go down. She had two seizures in January on the same day, but bounced back. However, on 3/1/06, she suddenly was not able to walk. The vet put her on steroids, which helped and she started walking again, but she was definitely near the end. On 3/7 after she was being tapered off the steroids, she got worse again. The evening of 3/7 was very difficult. We had made the decision that her time had come. Overnight she had 3 seizures. First thing on 3/8 we brought her into the vets office to her put to final rest so she would no longer have any pain. That was one of the hardest days of our life. 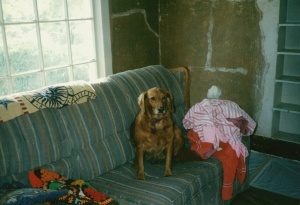 The house was very lonely without her. 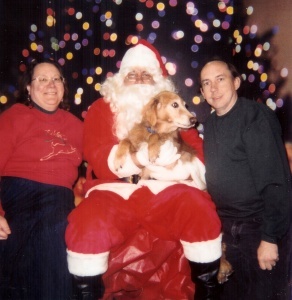 We were able to move on and is the reason why we signed up with Golden Bond to foster Golden Retrievers, as well as adopt Cinnamon a couple of month later. But Flame will be definitely missed and will remain in our hearts forever, and I’m sure in the many other hearts she has touched over the years. Thank you Flame for enriching my life and I am sure we will meet again, Love Daddy! Why did you move my couch? 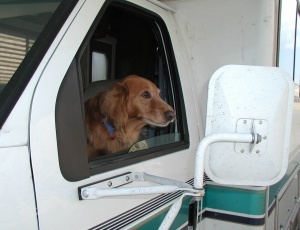 Is it clear to backup the RV?